Oh boy, never thought this would ever happen, but even though I now live in paradise, I'm finding myself getting a little homesick--this being my first Christmas away from home. I went back to New Jersey to visit my family at Thanksgiving and there wasn't any wiggle room in my budget to make another trip. 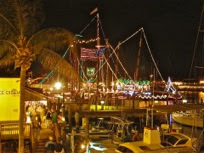 Besides, it's the high season in Key West and my boss Wally wants all hands on deck at our style magazine, Key Zest. Anyway, my roommate, Miss Gloria, noticed I was a little teeny bit down and she insisted on showing me how gorgeous a tropical Christmas can be. Even the boats in the harbor have lights on them! And there's a special tour on the Conch Tour Train to see the decorations all around town. And you haven't seen poinsettias until you've been to this island--they love this climate and they look amazing...Miss Gloria was so sweet about the whole thing. And that reminded me that I do have a family here in Key West now too. And finally, as my cat Evinrude was quick to say, isn't home where the cat is? 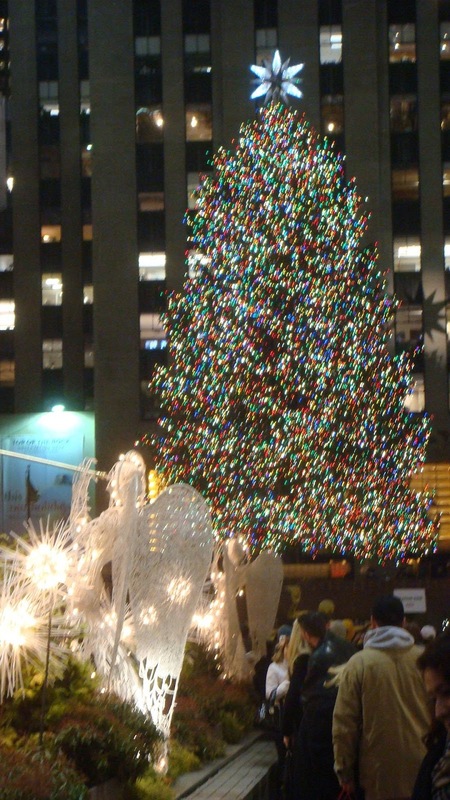 IS THERE ANYTHING YOU'LL BE HOMESICK FOR THIS HOLIDAY SEASON? 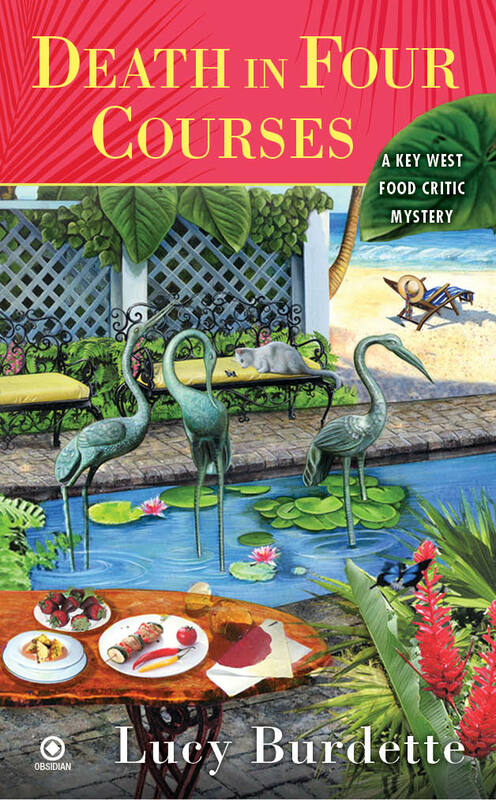 Evinrude (who, like all cats, is shameless about promoting himself) would like to suggest the Key West food critic mysteries, AN APPETITE FOR MURDER and DEATH IN FOUR COURSES. You can read all the latest if you "like" us on Facebook or follow us on twitter or check out our website! I don't think that there's anything that I will be homesick for this holiday season as I still live at home. Sorry for the boring answer. Thanks for this lovely guestpost, I have put your books on my neverending wishlist. Nothing has changed in my life, so no changes in how Christmas is going to be celebrated. Perhaps I do miss the quiet day for myself, now I am no longer single. I miss my Chihuahua, Sandi, she was with me for 18 years and it's been forever! Merry Christmas! What I'll miss is having both of my daughters and son in laws here for the holiday season. One son in law is deployed overseas and his wife lives nearly 2000 miles away. I also am happy to say that most of my family still lives in the same area we all grew up in and the rest will actually be coming home for Christmas! I know I am extremely lucky and I am a little nervous as my oldest goes off to college in the fall and I am wondering how much longer we will all be together for the holidays. I wish my niece was going to be with us at Christmas. No I won't be homesick this holiday season because home is where I will be with my family. It would be nice to win a cozy mystery, that would really make me feel even more at home. For many years while my husband was active duty (he's now been retired for just over a year) I couldn't listen to I'll Be Home For Christmas without crying. And it never failed that the choir students always had that song in their winter concert. In addition to being the librarian I am also the unofficial photographer of all events. It's really hard to get good pictures while you are crying. I'm still a bit homesick for my Granny - she raised me and even though she passed away almost 20 years ago, I still miss - especially at the holidays. I miss my sister, Denny. She lives in Wisconsin and is always so busy that we never see her. Maybe next year (fingers crossed), but we always have our memories. I live in Florida, for 13 years now, of course I miss my kids and grandchildren the most, but I also miss the snow at Christmastime. It just doesn't seem like Christmas without the brisk cold and the white stuff on the ground. Wendy, I grew up in S. California so snow was something we had to go visit in the mountains. After living in Oregon and experiencing a truly white Christmas I have come to miss it to. For my husband who grew up there (Oregon)I feel bad. I don't think it is likely to snow in Louisiana so I will have to create it some other way for him this year. Merry Christmas to you and yours. Crazy as it sounds, I'll miss football!! There is no Monday Night Football game on Christmas Eve and no NFL games on Christmas day this year. With just one college bowl on Christmas Eve and none on Christmas day it is going to be a lean two days! I think it would just feel more holiday like if the weather would get below 70 --- I don't need anything drastic like snow or freezing, just the 60s would put me more in the mood. I am homesick for my Christmas's past. My whole family (both sides) would get together at my Grandparents house and enjoy the day together. Wonderful food and stories. The best part was we had our very own Santa that would come to the house with a big bag of presents for everyone. My sister and I would pass out the presents. My brother and cousins never got to experience this as they are much younger that us. 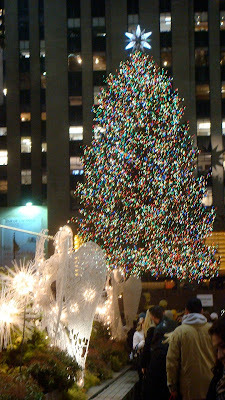 We do have some pictures of those Christmas's and I realize how much I really miss it. My family doesn't get together anymore. I visit my Aunt's house with my two small children and it breaks my heart that they don't get to experience what I did. Kelly, this is exactly what I miss as well. It is hard to create new traditions with my children as I miss my old ones. I hope you have a very special Christmas this year! My dad passed away in 2011. The family get together is not quite the same without him. I am trying to come up with some new traditions that involve my mom. She didn't decorate at all last year, but she is putting up a tree this year. I have a sister and two brothers who live in Australia and a sister in Idaho, I'll miss them very much. I will miss having family close by. We used to have huge gatherings when I was a child but now over the years everyone has either moved away or passed away :-( This is the second Christmas without my mother and she was Mrs. Christmas! Her spirit is still with me as I share the wonders and magic of the season with my children. I am a cat lover as well!!! I have read A Buried Lie by Roberta Isleib already. I really like this series. My parents are both gone, and my last aunts on both sides of the family died this year, so that makes me homesick this year for past Christmases. i will be homesick for home and snow. moving from alaska to oregon was not my brightest idea. I will miss members of my family that won't be with us physically. I will be homesick for my Mom, who lives far away, and for my Dad, who lives even farther away since he moved to heaven on October 29th, 2012. Can you believe I miss Christmas shopping? My husband and I are, let's face it, old, so it ends up that we gift with checks. But this year I sent out e-mails requesting gift suggestions, so I've already done some shopping. And Haley, I really enjoyed your first adventure when you arrived in Key West. Would love to read another one (and just may do that anyway). I miss watching my Grandma make her homemade sausage. She had a little area in her basement where she did this. It was such a treat to help her. I was always fascinated to watch her. She canned a lot of fruit and veg and she was so skilled. What a great Grandmother she was! I think Key West does sound like paradise. I'll be at home so I won't be homesick for anything. I want pumpkin pie for Christmas, though. I love the picture of your cat because I love cats! Love hearing your stories, though I cannot say I ever yearn for snow:). My dad died this year too. He was a quirky, funny, loving guy and we'll miss him at Christmas. I get homesick for snow because we rarely have it here in the NW. Nothing says Christmas like a warm fire, hot cocoa and snow on the ground. Thanks for the giveaway! I love this series. I miss get-togethers with my family, as they have all have gotten farther away as fate wpould have it. Being 69 I find my self settling for a little less running around, writing the checks and cards instead. But great-gramma I will soon be! I love these kinds of books! Great to read on a winter's night in Wis. Still 50 degrees this week--no snow. Very strange but enjoying it! Merry Christmas to all! I miss the Filipino snack "bibingka" rice cakes from my childhood in Manila. We don't get a lot of cool weather there, but Christmas, December, cool weather, and hot bibingka goes well together. I agree with Evinrude--home is where the cat (and dog) is---so I can't think of anything I'll be homesick for. I miss real North Carolina country ham and my daddy's Frozen Daiquiris. A steady stream of friends flowed through our house all Christmas Day. Mother gave up cooking a Christmas dinner because she was so busy frying the ham, serving the goodies she'd been baking for a month, and filling glasses with the drinks Daddy whipped up in the blender. Homesick for people more than places, hoping "the circle (will) be unbroken by and by" but glad I'll spend a little time with great nieces and nephews over the holidays, as the river of life moves forward. I started giving books from the start. Then one year put a cash "bookmark" in the oldest's book, rather than try to figure out what stuff to buy in addition. I put it on the page corresponding to his age -- now I do it for all of the young's . . . Always homesick for New England during the holidays and my family back up north. Moving to Fl has its benefits at times but . . . . . I will be missing my cat, he lived with me and my parents up until i got married. I finally moved in with my husband and he moved in with us, so when I travel to my parents for christmas, this will be the first year that my old tabby won't be there christmas morning, but 300 miles away with my father in law. I'll be homesick for my loved ones who are far away and cannot come home for the holidays. I'm very fortunate to live one town over from where both my husband and I grew up, so I don't have to be homesick! I'm homesick already for all my family that is scattered across the states. Homesick for IL and for my mom's Christmas cookies... All bazillion kinds!!! Hopefully I will get to see my parents and sister for christmas. Homesick for family, but I visited not long ago, so it's all good. I miss Christmas presents, we're have a tough year so no presents this year. My husband was hurt really bad in an accident a year ago & has not been able to work all year. So we don't have the money for presents. I miss playing Santa to all my friends & family. I LOVE to give presents, it's so much. Evinrude you should keep telling humans how to deal with problems. I value your reading recommendations highly. Must say you are a handsome lad. This book looks like another delightful read which has been added to my TBR list. I will be homesick for my St. Bernard who always made this season a challenge. She always managed to tilt the Christmas tree out of sheer happiness of an indoor place to rest. I miss my Mom. She died 3 years ago and I miss her terribly at this and every time of year She made Xmas so special. I miss having a family Xmas which now are gone forever. I loved the first Lucy Burdette book. Evinrude is so cute and the characters are adorable. I'm homesick every year for my parents and my late brother. I have a wonderful family of my own, a new granddaughter, and many friends, as well as a terrific husband to whom I have been married for 27 years. But at this time of year I miss my folks. My father died in 1983, my mom in 2000, and my only brother died in 2006. I always think of them at Christmas. When er were growing up, our parents made Christmas a magical time for us. My two older siblings and I were very close and we had our own memories as well as those with the entire family. It was a time that remains sweet and magical in our memories, and yet a time that can be no more. There are two winners chosen by Yoda, Elaine Ellen and Crystal. I wish I had books to send to every one of you! There isn't really anything that I am homesick for unless you count loved ones that are no longer with us (my grandfather, father and aunt). If you count that, then definitely my father. I live within a mile of my family so we are all together for the holidays. It's one of my favorite parts of the holidays- visiting with family and reminiscing about those no longer with us. The best part of the reminiscing is watching my son's face as he hears stories about his grandfather and great grandfather for the first time. He remembers both of them but the memories are vague since he was only 5 when they passed away. My grandfather passed away in 2006 and my father in 2007. My aunt was killed in a car wreck in 2011. My husband. Will be gone 2 yrs this Christmas. I won't be homesick. We have a new house in a new city and we are all together. I now live close to family, including grandchildren and have my six cats with me. It is going to be a great Christmas. just to have a home to celebrate Christmas would be my wish. I've been bouncing around the USA and world courtesy iof the military since 2005, and with promises of yet another deployment doesn't look like i'll have a decent one til 2014. I will be homesick for the entire family gathering together. My family is spread out and it is not possible to all be in one place. I'm a transplant, too! I've been here in FL for 71/2 years now, and I do miss Ohio a bit. Mostly my family and some of the food. I would love to win this book! Merry Christmas! I'm an Ohio transplant. I've been in FL for 7 1/2 years now. But I miss my family. And some of the food. I would love to win this book! I miss the east coast. I grew up in NY. I miss the store windows and walking in NYC over the holidays. I miss the old fashion Christmase Eves we use to have with the adults visiting and laughing and the kids playing. The whole family would be there, together. I'm home for xmas, so no need to be homesick. Unless it's cool this year and we can't go to the beach. Then I would miss the beach. Gotta love South Florida Xmas! I be with my family this Christmas so I will be home. I we are talking about where we grew up then yes I miss the Keys and my friends. I miss diving on Christmas day but I am happy that my family is together and lookforward to all the traditions we have carried north with us, no we no longer go in the water here on Christmas day.